In the super-competitive consumer goods marketplace, profitable trade promotions require the right framework and the right tools. Today, though the economy may be making a come-back, disposable income is still in short supply and there is incredible price transparency across channels. The goal is to make your product highly visible within in the retail environment so shoppers have multiple opportunities to put it in their shopping basket. In order to get the highest impact, you need a tool that will reveal the right promotion parameters based on measurable results. 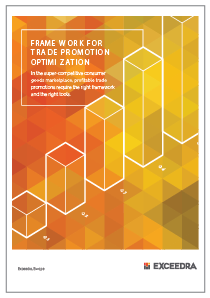 Our Framework for TPO white paper aims to provide an insight into pre-promotion planning, running the right promotions and measuring the results to build better trade promotions.